1. Just ‘hang out’ at the front of your house, have breakfast or a cuppa out on the veranda, or a picnic lunch/dinner on the front lawn. The kids will find things to play with and you’ll likely meet plenty of passers by; some will probably stop for a chat. 2. 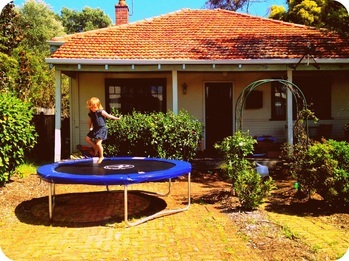 Put a cubby, trampoline or other fun items for children out the front of your house. Invite the neighbourhood kids to come and play. You may find your street really only needs one or two of these big ticket items. 3. Have you got the perfect driveway for bikes and scooters? Then how about inviting kids to use your driveway to practice their skills. You could put some chalk elements on the driveway as an invitation. 4. Super simple, cheap and as easy as can be, tie a large rope to your letter box or a tree in your front yard and invite kids to skip. This could also be a great chance for local residents to stop for a bit incidental exercise on their morning or evening walk. 5. 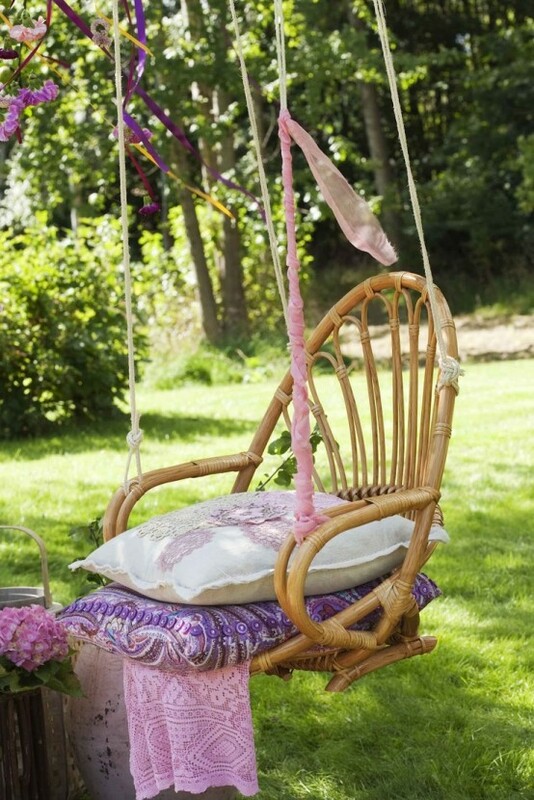 Have you got a great tree in your front yard that you could put a tree swing in? They are irresistible to kids and you are guaranteed to get passers by having a go. 6. 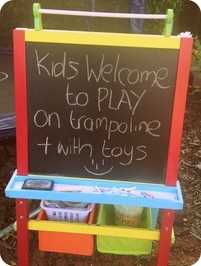 Buy a big bucket of chalk and add chalk games to your driveway, pavement or street. If you make a different one each week, kids will be intrigued to find out what’s coming next. 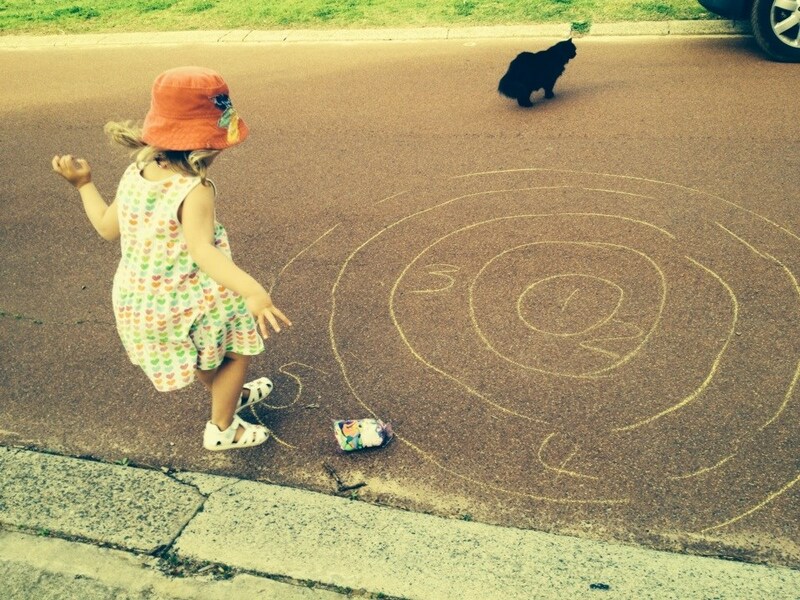 Hopscotch is a big favourite here, but we’ve also done target practice with a chalk bullseye and bean bags. 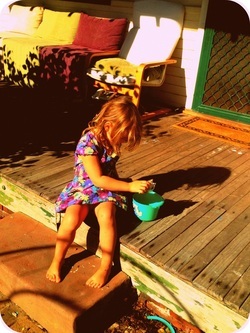 Leave plenty of chalk out the front as an invitation for kids to draw. 7. Plant fruit trees and/or build veggie patches out the front or your house. If you are happy to share produce; put up a sign saying kids are welcome to help themselves. Cherry tomatoes and beans are a winner with small hands. Front yard gardening is a GREAT way to meet your neighbours. 8. Place a geocache in your front yard. Geocaching is a world wide treasure hunt where small treasures are hidden and GPS coordinates recorded on an app. Hunters download the app and search for any treasures near them. You could quickly become the most popular house in the neighbourhood. 9. What about organising a street party, either for a special occasion like Easter or Christmas, or just because you feel like it? Pick a date and put some flyers in your neighbours letter boxes. You can either hold it on a suitable verge, your front yard or even apply to the council to close of your street. Some councils have programs to support street parties, or you may be able to apply for a grant. 10. Tear down your fence! Okay, this might seem a bit radical (especially if you’ve just built one) and sometimes it’s just not practical (if you live on a main road), but let’s face it, high front yard fences are a barrier to creating community. If you don’t really need that fence, then maybe you could consider removing it, or replacing it with a low picket or wire fence. If you were considering putting one up, perhaps reconsider. And of course if you don’t have a front yard, or yours is just not suitable for kids to play in, you can still build the playbourhood by playing out the front at family, friends and neighbours. See you in the playbourhood! This entry was posted in Community, Playbourhood and tagged community, playbourhood. Bookmark the permalink.